Expressly Network is the new FREE offering by Expressly. Access the portal to manage your cross-marketing campaigns with existing or new partners in our network. JOIN today and start acquiring new customers. Log into Expressly Portal - https://portal.buyexpressly.com and click ‘Get Started’ or view your notifications. Fill in the profile page with information about your website and upload a logo (best format is jpg, 500x500). After your profile has updated, click on ‘Verify your account’. Verify your account using one of the suggested methods or get in touch with us here. After your account has been verified, click on ‘Partner Finder’ and apply any filter (e.g., by size, industry). Wait for the partner to accept your invitation. You will be notified if they choose to accept. (For accepted partners) In your notification area, click ‘Create Bid’ to get started with your new partnership. Create the bid for your partner. If accepted, they will display your advertisement to their users. Once the bid is submitted, your partner will be notified. 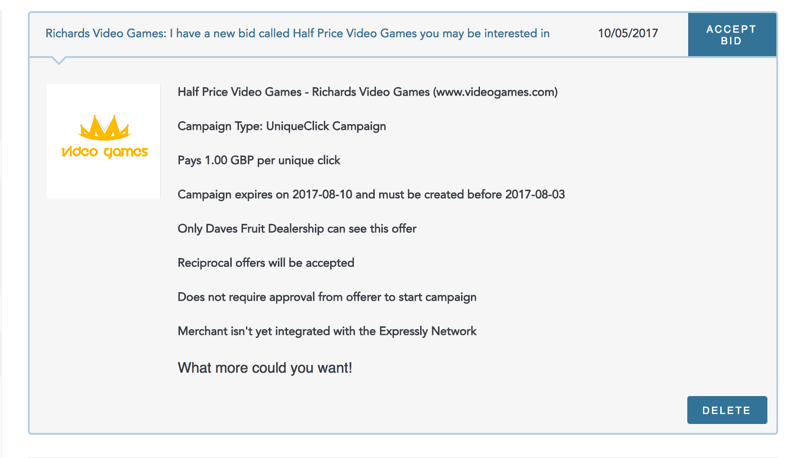 The available campaigns are email, post checkout or banner. Please look at the example below for email campaigns. Contact us for the other types. 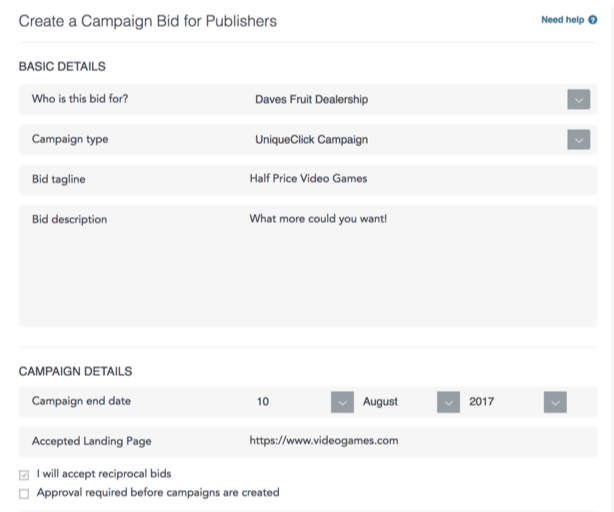 Go to ‘My Campaigns’ and click on the desired campaign. Here click on ‘Settings’. Download your partner’s banner. You will place this in your email. Click on the ‘Allow unrestricted e-mail address migration’ box. Copy the link https://prod.expresslyapp.com/…/ (found below the box you have just clicked on) . This will direct interested users to your partner’s website. Paste the clickthrough link you previously copied behind the banner and in the form of a call-to-action button (e.g. DISCOVER NOW). Please ensure to substitute the final part of the link (<email-address>) with the correct merge tag. For MailChimp the merge tag is *|EMAIL|*. Please note that all email programs have this feature. Briefly introduce your partner with a couple of lines of text to fully engage your customers. Your chosen partner will do the same. 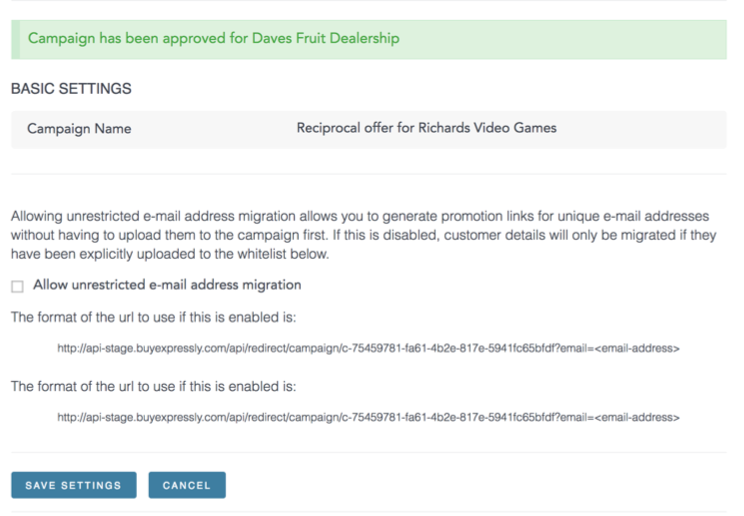 Send a test email to an email account which is already registered with their shop (e.g. their own one). Clickthrough to their partner’s shop. Check that the Expressly Lightbox is visualized. Click OK and verify whether they get a success message and become registered users. Once emails are sent you can monitor progress inside of the 'My Campaigns' panel. To change the name or banner of the revenue generating campaign (Sending users to partners site) simply select it and click settings. 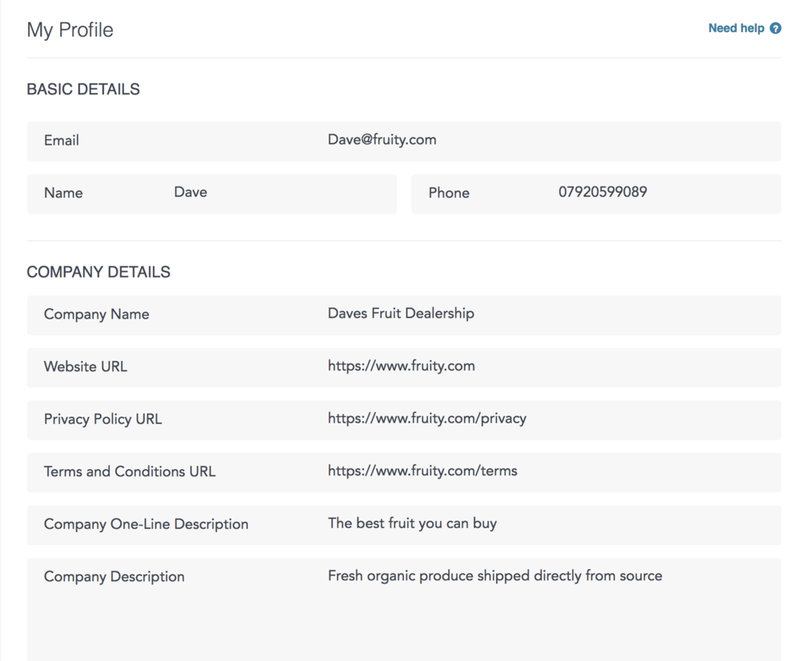 To change the landing page or tracking parameters of the growth campaign (Partners sending you users) simply select it and click settings. When you receive a bid you will be notified and you can choose to Accept it or Delete it. If the giver has asked for a reciprocal offer you will then be taken to the reciprocal offer page. Create the offer you wish to return.